This 'Watch' has a Radio-Corrected movement so the 'winder' is non-functional. 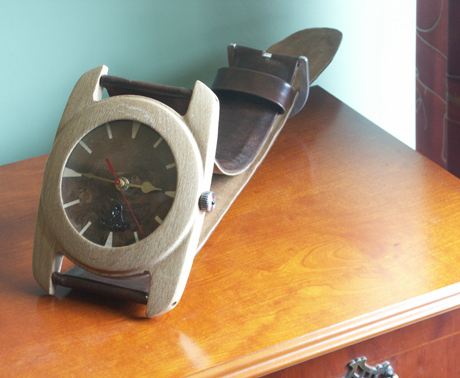 It started out as a wall clock in the style of the first wooden watches I made but when I found that I could buy a goat-skin for under £12 I decided to take it all the way and make a complete 'watch'. Starting with a slab of Oak - 1" thick, 7" wide and nearly 10" long - after mounting it on a specially made wooden face-plate I had to band-saw it to under 10" across the diagonal so that it would fit on the lathe. The face was trued up and then re-mounted with the (now) good face 'down'. A 5" dia. billet was trepanned out (I hate waste!) 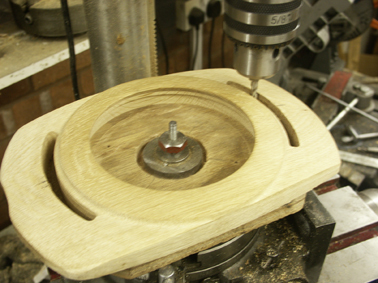 and the space for the crystal and dial machined away. Now I had two clean-true faces and an accurate diameter to locate on. Having removed the work-piece, the face-plate could be machined with a spiggot to locate the back diameter. Again the work was re-mounted and the front hole accurately machined to leave sufficient material to support the crystal. The rest of the front had to be turned by hand because I can't position the cross-slide closer than 30° (I needed 10). Not being able to swing a 1200mm diameter on my lathe I set up a jig by fixing a piece of timber clamped to the tool-post and a 'pivot' screwed far enough away to give a 600mm 'centre'. 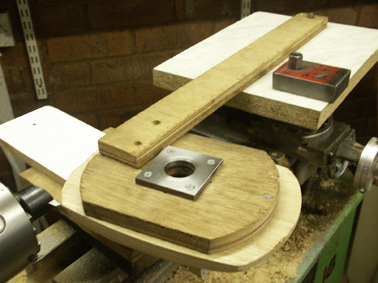 The work was supported on packing placed on the lathe bed. The top layer was melamine faced to provide easy slide. The 'feed' was put on by moving the saddle closer to the cutter held in the chuck and the work pulled/pushed manually to take each cut. Milling the space for the strap. This was set up on the pillar drill and rotary table and the work turrned through 60° whilst the cutter was gradually fed down into it. The Strap • Hole side - 100mm wide tapering to 80mm and 630mm long, Five 8mm holes at 40mm pitch. made from Antiqued Goat-skin, two layers sandwiching a padding of vinyl foam. Strap Bar • 8mm dia. Steel with three components main bar with 3mm pin, spring and end-piece with compressing groove and 3mm pin. Main Case • Solid Oak 25mm thick 165mm dia bezel,225mm across lugs. This has four Strap Anchors fitted into the lugs to take the 3mm pins of the Strap Bar. The Stem tube is steel and is simply there to hold the Crown allowing it to be turned (to little effect!). The Movement • A Radio-Corrected German 'Hechinger' unit which checks the Rugby Time Signal 5 times a day keeping the display accurate even through the DST changover each Spring and Autumn. The Dial • 6mm Ply, 136mm dia. 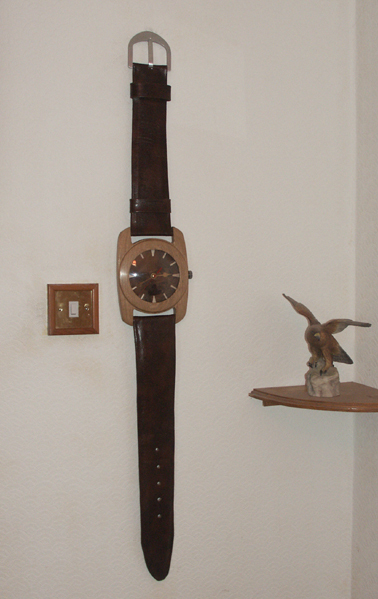 veneered with Burr Walnut 0.6mm thick with the hour markers in Rippled Sycamore veneer. The Hands • Standard 'Euro fit' Hands in Brass - 50mm minute and 43mm hour. The second hand is also brass but painted Red and cut down from a 95mm standard to 60mm. The Strap • Buckle Side - As the 'hole side' 100mm to 80mm, 390mm long with a fixed and a movable loop. The Buckle • Cut from 5mm thick Aluminium sheet, 100mm x 90mm hand filed and polished. the bar is 5mm Stainless Steel and is held in position with two 16mm long 7BA (2.5mm dia) grub screws. 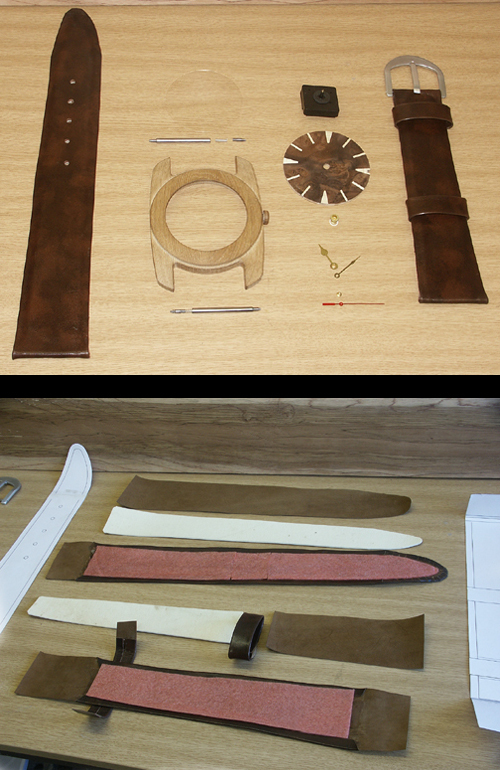 The lower picture shows the construction of the strap with two different dencities of expanded vinyl.